Your livestock may be prone to wandering off, and other animals or intruders may try to get into the area as well. To keep everything under control, you need high-quality cattle guards that are built and installed with expert precision. With Rustic Fence, your cattle guard will be built to last! Since 1964, we’ve been using the highest grade commercial fencing materials to build tough and durable cattle guards of all sizes. No area is too large or small for us to work with, and we ensure that our guards will keep your livestock inside of your property safely and under your control. During installation, our professional crew will stabilize and secure your new cattle guard so that it can withstand the force of your livestock and other elements. When it comes to securing your livestock, you can never be too careful, and our experienced team knows exactly how to secure your fence for years of heavy usage. At Rustic Fence, your safety and satisfaction are our main goals. 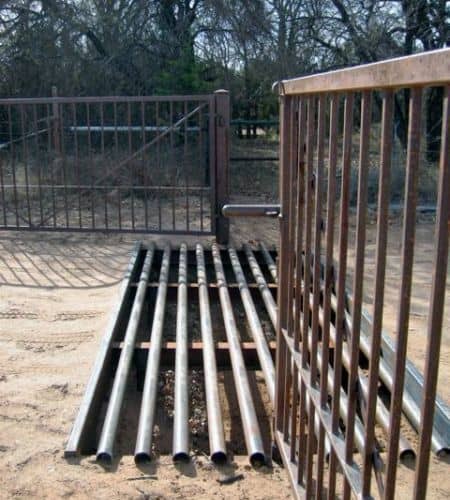 We will work with you to develop a custom cattle guard that fits your property and needs perfectly. For more information and to get a free estimate on your next cattle guard, contact us today at Rustic Fence!